We designed this structure to be dismantled and later rebuilt on site. We custom built this hobbit house in six panels, that would fit down a narrow side passage, and were then able to rebuild it in the garden. For the new owners it was very exciting to see photos of their bespoke structure completely finished before it was delivered. Everyone in the family got involved in reassembling and they have had great fun decorating the inside since. 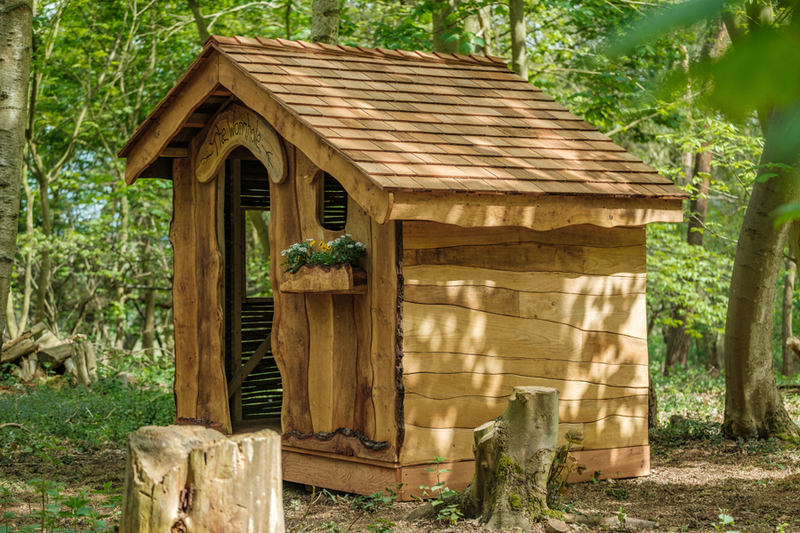 Built in the woods with Norfolk Burr Oak for the whole front and window box and the window framing, the sides are sweet chestnut and woven willow respectively. A larch floor and cedar shingle roof complete the build, with a hand-routed sign over the door to name the structure, as the owner requested. See our blog for more details on the journey from woods, to rebuilding, to being in use. Built in Suffolk, delivered to Bearwood, Birmingham.